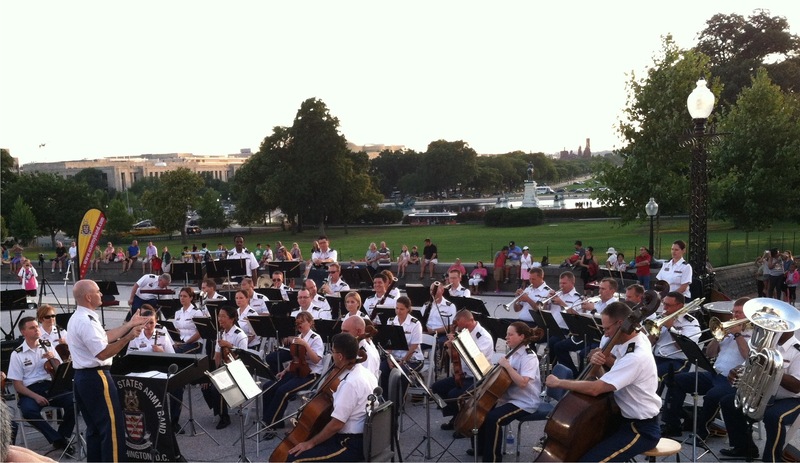 Last night I sat on the steps of the United States Capitol and enjoyed my tax dollars at work in the form of the U. S. Army Band “Pershing’s Own.” It turns out that this elite army band is actually a collection of nine ensembles, including string players and vocalists, who combine in a variety of ways to perform thousands of concerts a year. Last night, as part of their free outdoor concert series on the National Mall, a small orchestra and some mighty fine singers performed a lively, one-hour program of favorite orchestral overtures and opera arias. For free! Opera! In uniform! My visit to the Capitol came after a week spent at the Center for Hellenic Studies, an elegant little enclave in a wooded glen just off Embassy Row. I have been studying Homer’s Odyssey with a group of twenty professors from small colleges and two expert classical scholars. At our meals together, talk among the professors often lingers on the topic of the humanities, and how our various institutions are attempting to preserve and revitalize them. How do we justify—to our students, their parents, and our administrators—spending time and resources to study the past, to read novels, to ponder philosophical quandaries? Here we are, spending an entire week studying in depth one long, old poem—a great and fascinating one, but can we even explain why? This program—which I’ve been calling “Homer Camp”—is funded by the Mellon Foundation through the Council of Independent Colleges. I’ve been thinking this week about the enormous resources required to support this beautiful center and its project of making classical texts, along with endless volumes of scholarship and research tools, freely available to the public. I’ve been thinking about the years of dedication required to master any field of study, and the hours we put into teaching young people, and the years of their lives they spend in college. It requires enormous resources to support things that are extremely valuable but whose value is difficult—actually impossible—to quantify. Yet unquantifiable goods are perhaps the most distinctive markers of the beautiful civilization. Or at least it seems so after a week in which my “mission” was to study epic poetry, and after a warm summer night, sitting on the steps of a magnificent neo-classical building alongside a diverse gathering of people, listening to an army sergeant sing an aria.